Vivian Ireene Pierce is dressed in shorts and pigtails and is barefoot. 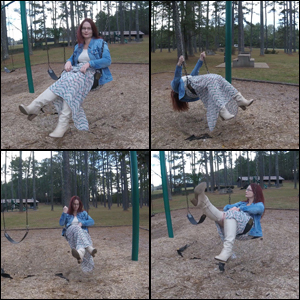 She swings back and forth, using her feet to push off and to slow herself down. The camera gets full body shots while she swings as well as an angle from her POV. Once she is finished swinging, she stands up and lifts her feet up to brush them off, but they are pretty dirty.